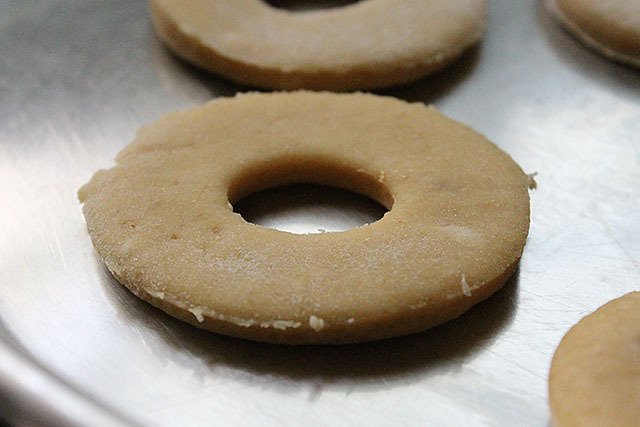 Easy Homemade Doughnut Recipe with step by step instructions! I don’t think so we need to know what is Doughnut?? we must have eaten atleast once in our lifetime. Traditionally it’s a fried pastry and baked in modern days. Mostly it’s in a ring shape with a hole however it’s made in round shaped, stuffed doughnuts etc. They are also known as Donuts, Fasnacht, Fosnaught, Paczki and also Kinklings. You would be surprised to see the various kinds of doughnuts made these days. My personal favorite is chocolate doughnut. Today I have made a traditional doughnut which is deep fried. 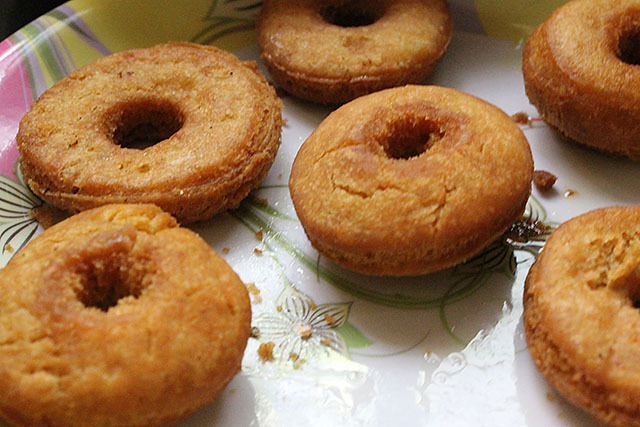 Such deep fried doughnuts are quite often made in Goa during Christmas and also all in other parts of the world. Now doughnuts are made with yeast, without yeast, with eggs, without eggs etc. I have made with eggs. Coming back to doughnuts 🙂 I have further frosted my doughnuts with dark chocolate and white chocolates. You could just sprinkle some cinnamon powder and caster sugar if you don’t like frosting. 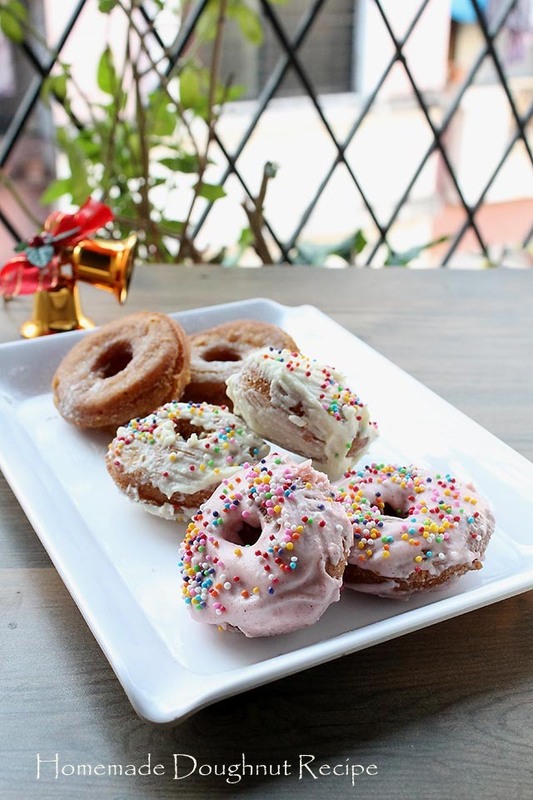 This Homemade Doughnut Recipe is easy to make and once you make you will keep making them. You could experiment with your doughnut dough by adding nuts, raisins, candied peels etc use your creativity let it flow. 1. Sift flour, salt and baking powder. Place it aside. 2. Add butter and rub the butter and flour together with the help of your palm. It should look like bread crumbs. 3. 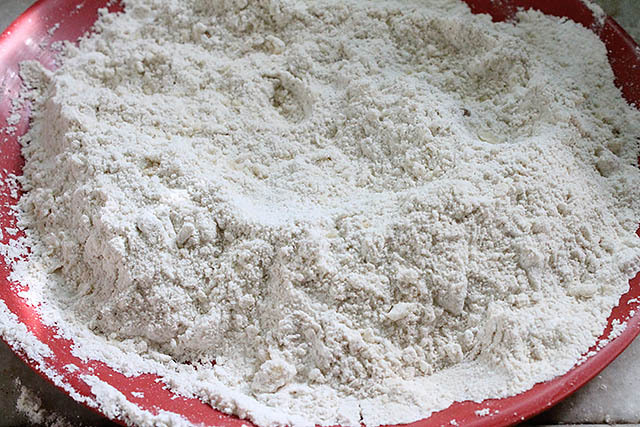 Make a small well in the sifted flour add egg, milk, baking soda, vanilla essence and the powdered spices. 4. Combine all and knead into a soft and smooth dough. If it’s too dry add little milk preferably the dough should be slightly sticky. 5. It should be super soft. 6. 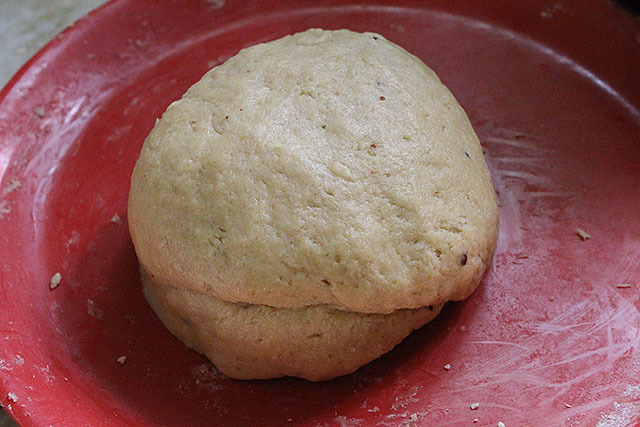 Allow the dough to stand for twenty mins and place into the freezer for five mins. Please don’t keep for a longer time else it will freeze. Make 3 big balls and roll each ball with the roller. The width should be around 1/2 inch. 7. Cut doughnuts with the doughnut cutter. If you don’t have a cutter it’s okay make small balls Or cut with the help of a glass. Take a lid of small bottle and cut from the center. Your doughnuts would be shaped without a cutter. 8. 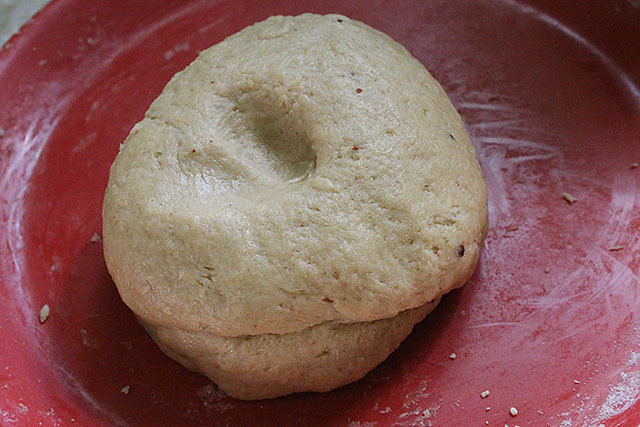 Repeat the same with the rest of dough and with leftover dough make round balls and fry. 9. Place a deep vessel with oil on high heat. Once oil is very hot reduce to medium temperature. 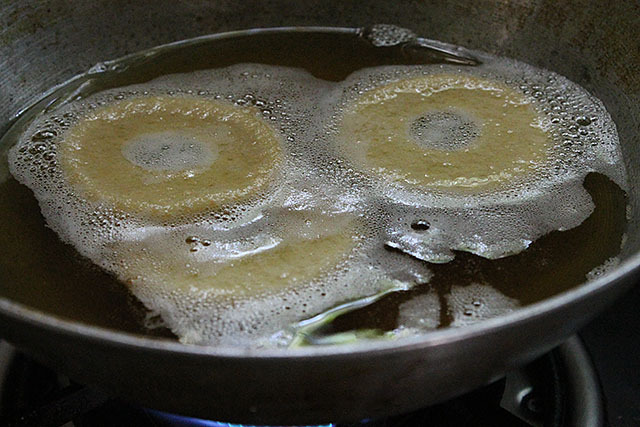 Gently fry the doughnuts from both sides until golden brown. Fry only 2 or 3 at a time don’t cluster with too many else they might break. 10. You would see they rise as they fry. Remove them with the help of slotted spoon. Place them on absorbent napkins. Allow to cool. Now you could sprinkle some cinnamon powder and caster sugar Or make frosting. I don’t have pics for the frosting steps. Just melt both white chocolate and dark chocolate on a double boiler. Now dip the doughnuts gently over the melted chocolates from both sides. Place them over a greased pan sprinkle the candies Or sprinklers over them while chocolate is still warm. Allow the doughnuts to cool down and serve them warm Or chilled. Sift flour, salt and baking powder. Place it aside. Add butter and rub the butter and flour together with the help of your palm. It should look like bread crumbs. 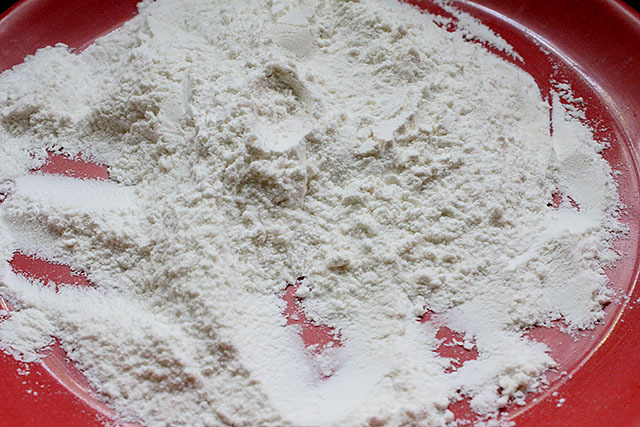 Make a small well in the sifted flour add egg, milk, baking soda, vanilla essence and the powdered spices. Combine all and knead into a soft and smooth dough. If it's too dry add little milk preferably the dough should be slightly sticky. It should be super soft. 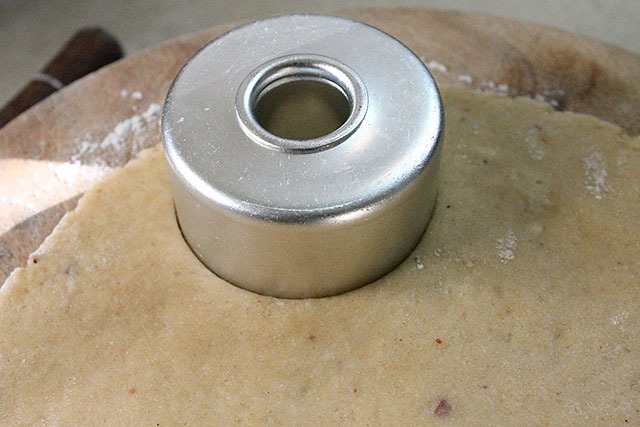 Allow the dough to stand for twenty mins and place into the freezer for five mins. Please don't keep for a longer time else it will freeze. Make 3 big balls and roll each ball with the roller. The width should be around ½ inch. Cut doughnuts with the doughnut cutter. If you don't have a cutter it's okay make small balls Or cut with the help of a glass. Take a lid of small bottle and cut from the center. Your doughnuts would be shaped without a cutter. 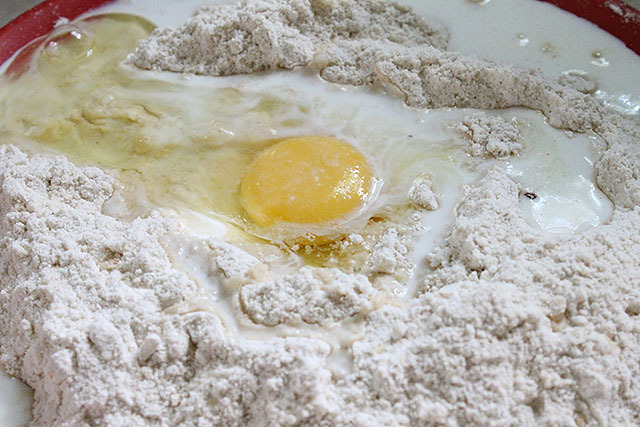 Repeat the same with the rest of dough and with leftover dough make round balls and fry. Place a deep vessel with oil on high heat. Once oil is very hot reduce to medium temperature. Gently fry the doughnuts from both sides until golden brown. Fry only 2 or 3 at a time don't cluster with too many else they might break. You would see they rise as they fry. Remove them with the help of slotted spoon. Place them on absorbent napkins. Allow to cool. Now you could sprinkle some cinnamon powder and caster sugar Or make frosting. I don't have pics for frosting steps. Just melt both white chocolate and dark chocolate on a double boiler. Now dip the doughnuts gently over the melted chocolates from both sides. Place them over a greased pan sprinkle the candies Or sprinklers over them while chocolate is still warm. Allow the doughnuts to cool down and serve them warm Or chilled. 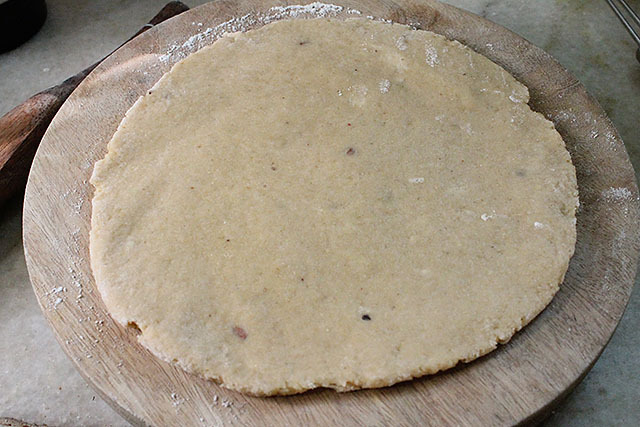 It's important that the dough needs to be soft and chilled before cutting and frying. If the dough is dry please add some milk. These an be stored into the fridge for 4 to 5 days. Sure Gemma give me some time will post a recipe for eggless doughnuts. Maria, thank you for yr response and wishing you a beautiful year ahead with God’s Blessings !! 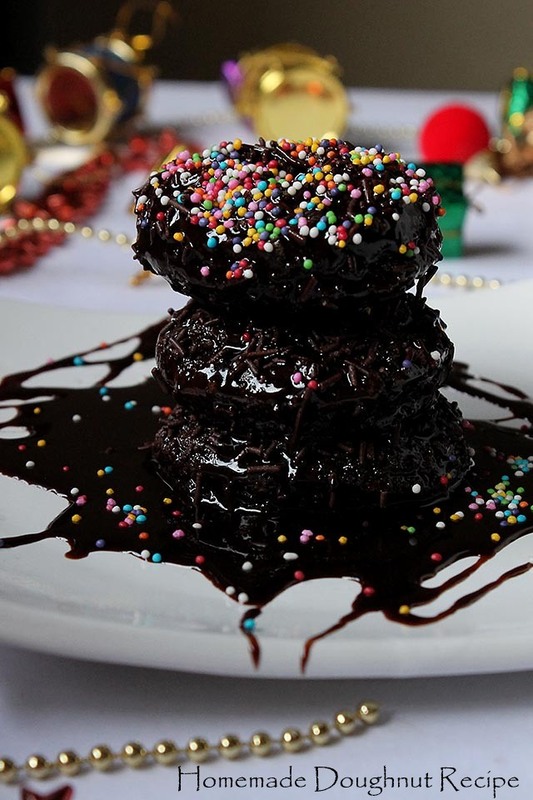 Hi Maria, doughnuts is one thing I have not baked so far, my kids always ask me to make, but dont know why I stay away from it….after seeing your step by step pictures, I am tempted to try it, thanks a ton for the recipe….Merry Christmas in advance. Nisha I will come up with a baked version soon but deep fry also tastes yum 🙂 there are many dishes which I am yet to try … thanks for dropping by. Now I can comment. 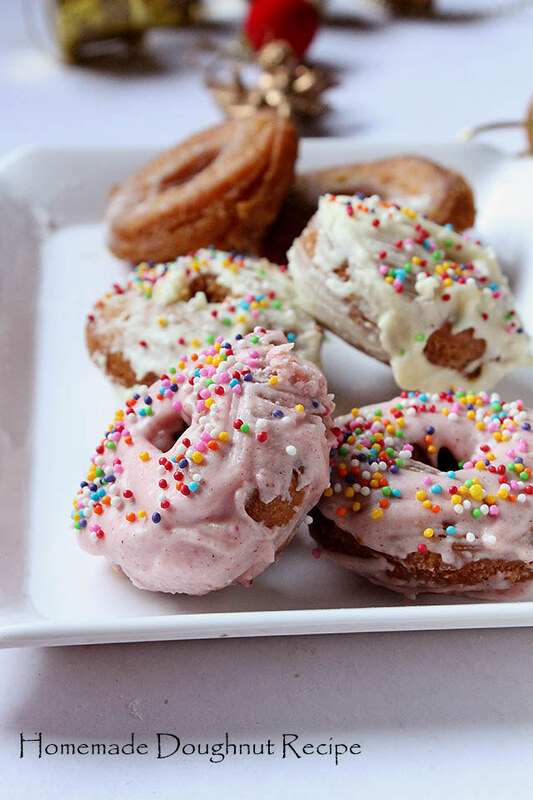 very nice homemade doughnut recipe.